Bring your architect and create the Greenwich Village home you&apos;ve dreamed of! 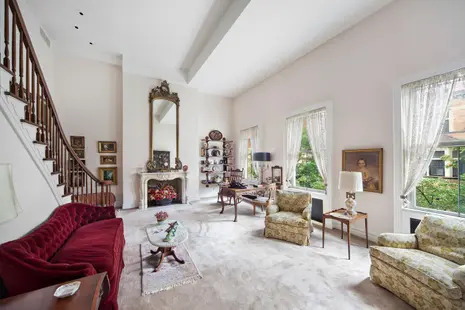 This expansive and rare 2/3 bedroom, 2.5 bath 2500sf aprx triplex on quiet tree-lined West 11th Street is situated on one of downtown&apos;s most coveted blocks, right off prized Fifth Avenue. The gracious living quarters begin on the main level with high airy ceilings and generous windows. Enjoy a wonderful layout for entertaining, featuring a spacious living room with 3 oversized oak-framed South facing windows and a wood-burning fireplace, an extra-large eat-in kitchen, and a light-filled sunroom with built-in seating that serves as versatile space for use as a den, dining room or other purpose. This level also has a built-in wet bar, powder room, LOTS of closets, and a full separate laundry room with sink. The mid-level of the residence, accessed by a graceful staircase in the living area, presents a nice-size media room/library with a wood-burning fireplace, wall of built-ins, and glass door to a big outdoor terrace. 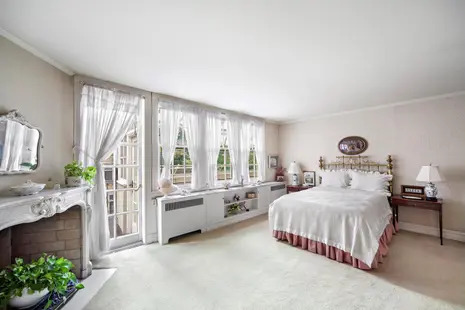 On the upper floor, the master suite is a comfortable retreat with a wood-burning fireplace, private south-facing terrace, huge walk-in closet and sky-lit bathroom. 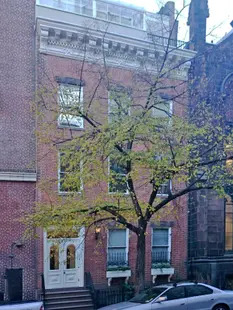 The second bedroom also has an en-suite bath, and 2 closets for ample storage.Built in 1900, 11 West 11th Street is a beautiful 4-story townhouse and well-maintained co-op on a historic block near diverse shops, chic cafes and popular restaurants like Gotham Bar & Grill. 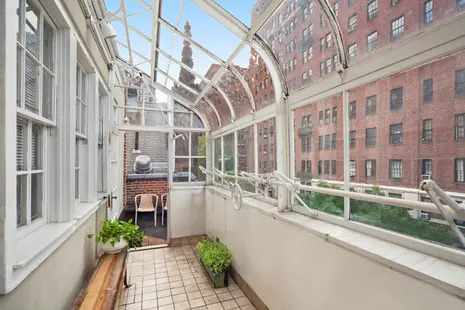 Also nearby Union Square Park with its famous weekly farmers market, Washington Square Park, movie theaters, subway and bus transportation, and lots of other attractions and conveniences for which the area is known.